The Vice-Chancellor, Prof. Kolawole Salako, represented by Prof. Tolu Eni-Olorunda also speaking at the occasion. Nigerian government has been charged to promote the use of recyclable papers as substitute to plastics, in order to curb the increasing menace of plastic pollution that is gradually defacing our environment on daily basis. This charge was given by the Head of Department, Social and Environmental Forestry, Faculty of Renewable Natural Resources, University of Ibadan, Prof. Busuyi Agbeja while delivering a Keynote Address titled, “Beat Plastic Pollution”, at the Federal University of Agriculture, Abeokuta (FUNAAB), in commemoration of the 2018 World Environment Day and the hosting of the 2nd Commonwealth Forestry Association (CFA) Conference. Prof. Agbeja who is the President of CFA, Nigeria Chapter opined that “To avoid the danger of plastic pollution, it is high time Nigeria commences the plantation of Gmelina arborea for huge production of paper to reduce the use of plastic in our environment”. According to Prof. Agbeja, Plastic pollution is one of the biggest environmental challenges facing us today and this has constituted a global problem. The Guest Lecturer said Plastic products have attractive qualities such as its versatility, lightweight, flexibility, moisture resistant, strong and relatively inexpensive. He pointed out that plastics are durable and very slow to degrade, as they become waste with staying power after use, noting that “tons of plastic debris are discarded every year, everywhere, polluting lands, rivers, coasts, beaches and oceans all over the world”. Prof. Agbeja said that Environmentalists have long denounced plastic as a long-lasting pollutant that does not fully break down, and not biodegradable, stressing that, an accumulated plastic pollution worldwide ultimately end up at sea. The President of Commonwealth Forestry Association (CFA), Prof. Busuyi Agbeja making salient while speaking on the theme, “Beat Plastic Pollution”, commemorating World Environmental Day. 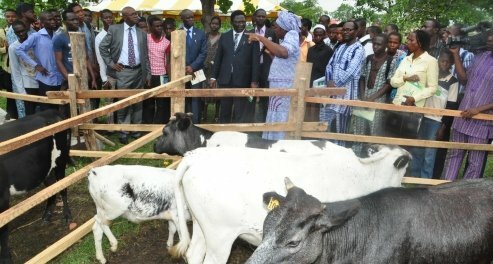 He said Nigeria is a typical example of West Africa country where plastic pollution is very grievous, stating that the use of plastic has become a serious challenge because If we visit parks, markets, roads and public institutions, hardly, is awareness raised about how everyone has a role to play in taking care of the environment”. Disclosing its dangers on human health, Prof. Agbeja said that the production of plastics involves emission of obnoxious gasses, which pose serious health problems to the workers and neighbours. In addition, he said that plastic debris consumed by fishes is also dangerous to human beings who will end up eating them because such plastics are likely to find their way into the tissues of human bodies with potentially harmful consequences. Earlier, the Vice-Chancellor, Prof. Kolawole Saloko, who was represented by Prof. (Mrs.) Tolu Eni-Olorunda welcomed participants to the CFA Conference and World Environmental Day Celebration. The Vice-Chancellor said that the theme “Beat Plastic Pollution” is more suitable for the gathering as climate change had presented a massive challenge to Africa, especially Nigeria because of widespread poverty, hunger and diseases. Prof. Salako said that the Forest, both natural and man-made is an important and an indispensable provider of ecosystem goods and services for livelihood generation. Also, the Director, FMENV/FUNAAB Linkage Centre, Dr. Jubril Soaga added that the theme for the 2018 World Environment Day is to remind humanity of the excessive addition of plastic to the environment and the negative effect of plastic pollution on living things. A cross-section of invited guests and participants at the occasion. The event drew stakeholders, including students and teachers and had in attendance, Chief Bisi Rodipe of Bisrod Furniture, a frontline investor in wood production and forest conservation and Mr. Tunde Sodeke representing the General Manager, Ogun State Television.